Just when you think canning season has come to an end, hang on, there is one more thing you will want to do with all of those ‘end of the season’ tomatoes. No, they aren’t the prettiest of tomatoes, but they still can be put to good use without wasting them. So they may not be the prettiest tomatoes – but late summer tomatoes are thick walled and packed with flavor – perfect for barbecue sauce! 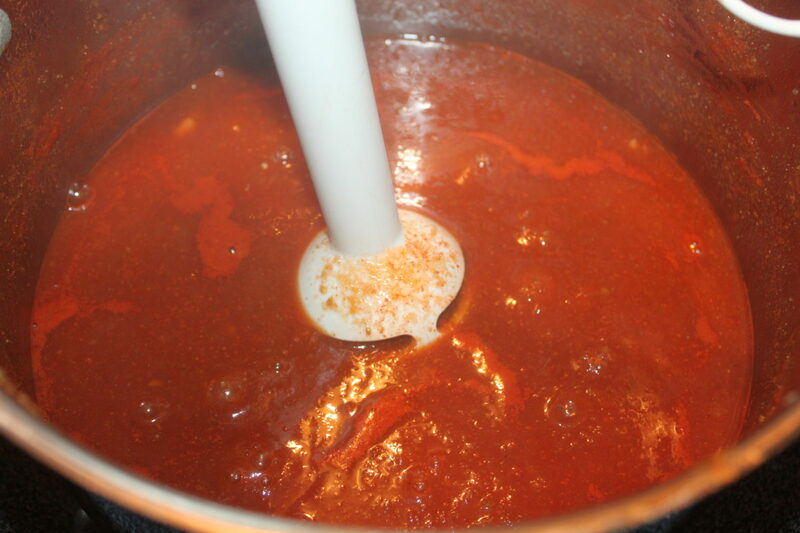 Making your own barbecue sauce is a great way to preserve the last of your tomatoes, and have a tastier and healthier condiment in your pantry rather than the store bought version. We use barbecue sauce as a marinade, as the base for shredded chicken/pork, on grilled meats, and even in rice and vegetable dishes to give it that extra smoky kick! Why make your own? Like we said, it is a great use for those forgotten tomatoes, and who wants all the additives, preservatives and extraneous amounts of sugar added to your sauce when it isn’t necessary. Plus, having it on hand in your pantry ready to be used prevents unnecessary trips to the grocery store. And I am all for spending less time (and money) there! 1. 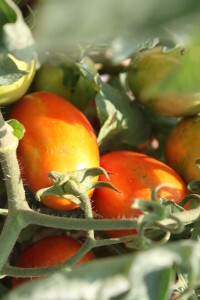 Core your tomatoes – cook until softened and run through a food mill to remove the peels and seeds. You can also use a food processor and then strain the pulp through a fine mesh strainer. 2. In a large stainless steel saucepan, combine tomatoes, celery, onions, green peppers, and jalapeno peppers. Bring to a boil over high heat, stirring frequently. 3. Reduce heat, cover, and boil gently until vegetables soften, about 30 minutes. 4. Working in batches, transfer mixture to a blender or food processor (making sure to fill the container only half full) puree until smooth. You can also use an immersion blender to complete the process. 5. 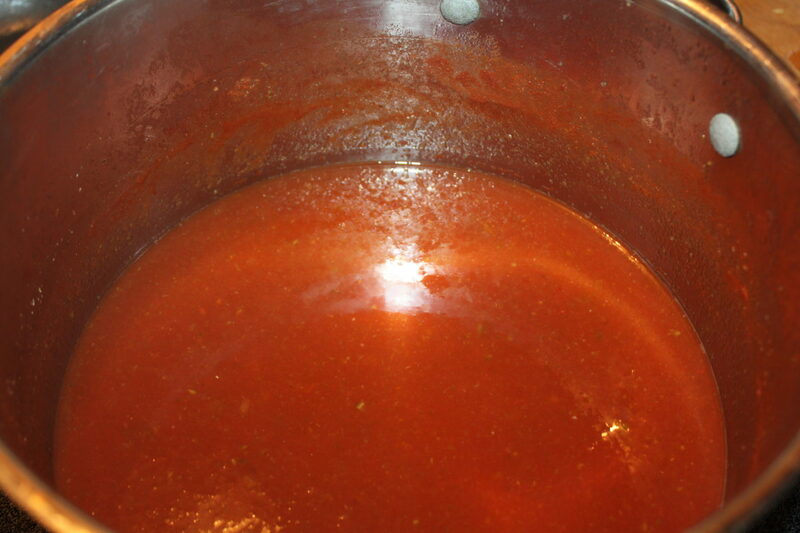 Return pot and heat to a low boil, stirring occasionally, until the sauce reduces by half (about an hour). 6. Stir in vinegar, brown sugar, garlic, and spices to the tomatoes. Increase heat to medium and boil gently, stirring frequently, for about 20 minutes. 7. Using the process before in batches or with the immersion blender, blend until smooth. 8. Heat on low until the desired thickness, about 1 hour. 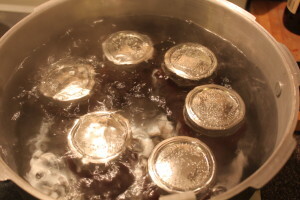 Water bath canning allows you to enjoy homemade barbecue sauce all year long! 10. While you continue to reduce to the desired thickness, prepare water bath canning jars. Fill warm and sterilized jars leaving 1/2 inch headspace. Wipe rim, add warm lid and finger tighten the ring. Process in a hot water bath for 35 minutes (time starts when the water reaches a rolling boil after the jars have been inserted and remember to adjust as needed for altitude). Remove and place in a large towel -cool overnight. Check to make sure jars are sealed by pressing on the tops of the jars. If they don’t move, they are sealed. If they pop up and down, refrigerate or freeze. oldworldgardenfarms September 5, 2014 September 2, 2018 Cooking, Recipes, Sauces Dressing Jams Misc.